Many people are afraid to travel beyond the destinations they already know. If you really break down the phrase “Stepping out of your comfort zone,” it means doing things that you don’t feel comfortable with doing. Getting outside of your comfort levels. I encourage you to push yourself in unfamiliar places, to do things that you wouldn’t normally do. a face in the crowd of 40 other tourists who look and dress like you, it's likely that the locals of that country won't even notice you. But walk into a shop, cinema or café on your own, or with one or two companions, and you may enjoy more personal attention. Even asking for assistance -- like how to order local coffee in Bosnia, or how to book a camel ride in Egypt -- brings out the hospitality in people. And thanks to Facebook or other social media, new friendships needn't end when your place departs for home! When you really think about it, it’s highly unlikely that you’ll see any of the people again that you meet in foreign countries. Take that mentality, and you can be whoever you want to be. That’s the way to do it! By stepping out of my comfort zone over the last few years, I have created incredible and unforgettable experiences. 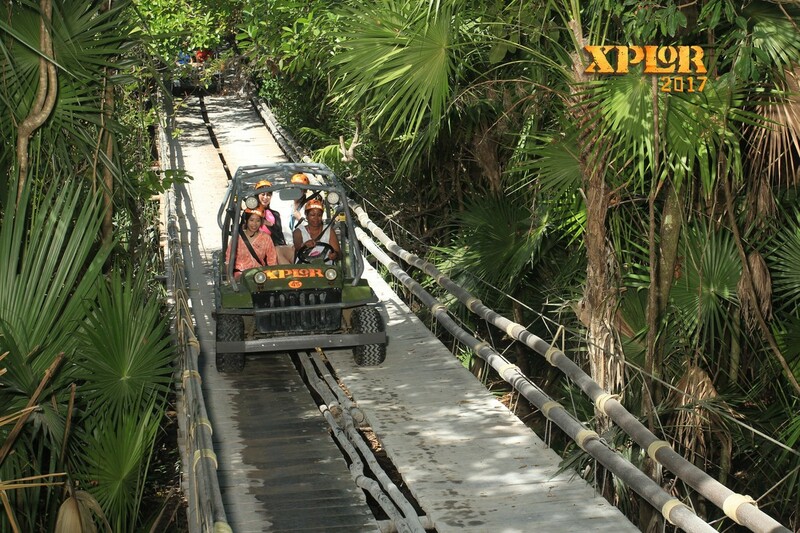 I can’t even describe to you how thrilling it was to go Zip-Lining in Riviera Maya. Largest zip-line course in North America. 2 circuits of 7 zip-lines each. A total of 2.4 miles of zip-lines. The highest stands from 49 yards (45m) high). I also made friends with some strangers in Riviera Maya who didn’t speak a lick of English. They didn't know how to drive the Amphibious Vehicle on the course...they wrecked it into a tree and I stopped to help them. They weren't familiar with driving on the left side of the vehicle...so they rode with me in my vehicle to finish the course. Or the time when I went Parasailing in Punta Cana, DR, for the 1st time. All of these experiences are what keeps me hungry for more. There’s no question that it’s the best way to live life. Traveling, at its best, is very much about leaving your comfort zone. It requires a sense of adventure and a willingness to try new things, even if that new thing is simply flying to Minneapolis for the weekend on a whim. A good way to discover your own place in the world is by surrounding yourself with a foreign culture, a language you don’t know, or customs you’re unfamiliar with. Testing your limits can reveal what you believe about both yourself and those around. It offers a sense of connection you might not have otherwise felt. When you do something that makes you uncomfortable and you don’t die doing it, it’s a good reminder that your fears may be unfounded and your interests more far-reaching than you ever expected. We build things up in our heads, presuming an array of terrible outcomes. But in reality, it’s usually not so bad (and sometimes, it’s amazing). Traveling solo, for instance, is a source of frequent anxiety for many people. It requires being a companion to yourself at restaurants, at bars, in museums, and on walks. It means potentially feeling exposed when there’s no one else to talk to in public settings. When you travel alone, you have to force yourself out of the hotel room and into the world completely on your own. If you decide to travel, then you are already most likely agreeing to step out of your comfort zone. Travel means different things to different people, but ultimately, it’s about immersing yourself in new places and ideas, broadening your perspectives and learning how other people and cultures live. Travel requires a sense of adventure and a willingness to try new experiences. What are you waiting for? Jump in with both feet! ​Can we just skip to the part of my life where I'll be traveling the world? The more we travel, the more we realize that our home is so much more than the town, city, state and even country that we’ve grown up in; we realize that our home is the world, this planet, and we become more conscious of how we can harmoniously live and support one another. Meeting people from other cultures will teach you that the way you’vebeen looking at the world isn’t the way everybody else does. In fact, your point-of-view might have some major blind spots. Seeing the world for yourself will improve your vision and your grip on reality. You’ll be constantly surprised at the flavors the world has to offer. The way people in other cultures and countries prepare food, and break bread together (not that all cultures even eat bread) will astound you. You imagined it, daydreamed about it, envisioned it. Guess what? It can be done. Around the world travel is possible, you just have to decide you’re willing to take the first step and start planning your itinerary. Because you can. Because you want to. Because it beats the alternative (staying home). ​Why not pick up your tickets and get the ball rolling! ​Travel Agents can help you decide where to go by walking you through the pros and cons of destinations based on the varying interests (and ages) of the people in your group. Not only that, they’ll deliver insider insights and access. They can tell you how to avoid the crowds at major sights and where the locals eat. They can even pair you with designers and architects who moonlight as walking-tour guides, get a local artist to open his studio to you, and direct you to hidden corners of a city. And they also, crucially, know how to put together a seamless itinerary. Even if you’re not planning a particularly complicated or exotic trip, it’s worth considering the additional value of professional advice. Much of the travel industry is built on relationships, both formal and informal, and if your advisor has the right ones, it can pay off—literally—for you. VIP Treatment: Many Travel Agents are part of large consortia that leverage their members’ collective buying power to deliver guaranteed rates as well as perks for their clients. What that may mean for you: if you book a night in a luxury hotel through the right person, you can get an upgrade, daily breakfast for two, a $100 restaurant credit, and late checkout, along with a welcome amenity of wine and treats. On a seven-night cruise, it could be a cabin upgrade and $500 of shipboard credit. And since the agent is making a commission off the booking, you won’t be charged a markup. Agents status, which translates into even more perks for clients. And then there are the informal relationships that top agent cultivate with hotel general managers around the world. So chances are, if you’re looking to book with a major company, there’s someone who can get you more bang for your buck. Lower Rates and Fares: The most affordable rates and fares aren’t always found online, especially when it comes to luxury travel. Hotels and cruise lines that don’t drop their prices for online travel agencies often offer special deals and promotions to members of their partner consortia—who, in turn, alert their clients. These can be everything from four nights for the price of three to an upgrade to business-class tickets on an airfare-cruise package. Similarly, fares for first- and business-class seats on international carriers can vary widely, depending on who is looking for them. Travel advisors frequently have access to lower prices than those available to the public, usually as a result of consortium contracts. Troubleshooting: Every trip has its share of hiccups. The small ones can be fun (or at least instructive) to navigate. The big ones—a missed cruise connection; a cloud of volcanic ash—can be a nightmare. Last winter, a succession of brutal storms helped log a record 126,000 cancellations on U.S.-operated flights that originated domestically. In situations such as these, the value of travel advisors really kicks in. They’ll rebook your flights (sometimes via a VIP phone line with the airline, sometimes sitting on hold for hours), either finding seats on planes that appear to be full or springing you to the top of waiting lists for ones that indeed are. They can also get you last-minute hotel rooms and file insurance claims on your behalf. Lost luggage? They’ll track your bags and have even been known to keep a local store open late so you can buy replacement clothes in the meantime. Ask an advisor about his or her after-hours service before you book. Leisure is an important part of health – it’s the portion of it that is adaptable to you, your needs, your dreams, your desires. Research continually shows that people who feel fulfilled are not only happier, but they also live longer! Traveling allows the mind to expand and literally see the world in new and different ways. When we become accustomed to a certain way of living, our minds tend become closed to many of life’s possibilities. Traveling with another person, or even a group, brings everyone closer together by sharing new experiences simultaneously. Do you feel guilty when you travel for pleasure? If so, you're not alone: Americans are often reluctant to take travel time, even when it's due. Nearly half of Americans agree that travel isn't a luxury, but a necessity. And here are some reasons that’s so right: After vacationing only a day or two, 89 percent of people are able to relax and leave work stressors behind. Not surprisingly, the survey also shows that group travel builds social ties, which studies suggest help nurtures interest in life-long learning. And small groups are especially able to deliver personal interactions; whether enjoying a picnic lunch by a vista, or encounters with local families during home-hosted lunches and dinners. Active travel is proven to lower health risks such as diabetes, metabolic syndrome, high blood pressure, heart disease, colon cancer, breast cancer, depression levels and more. Why do we travel? What makes us up sticks, subject ourselves to bleary eyed early mornings, hideous flights and unsettlingly new diets? Why do some choose to flop somewhere hot whilst others subject themselves to privation in little visited inhospitable regions? For many it is seemingly simple, we have to. It’s in our blood, an itchy footed restless careless desire to up roots and see and do something new, to break the routine of life. For many of us, the glory of travel is change, change from our routines, change from the irritations of weather, work and culture. We swap city for country, affluence for simplicity, fast- for slow-living (or vice versa), sloth for action and security for risk. Seeing new places, trying new things (e.g. foods, activities, languages), meeting newpeople - it is all about change. Simply by changing our surroundings alone, we are able to change our mindset and free ourselves from the stresses and strains of everyday life. Traveling can affirm or bump you from the path you’re on. Maybe you’ll want to stay on the path you’ve paved for yourself, but to never really think about it, to never distance yourself from what you think you should be doing, is to miss an opportunity reserved for the young. We’ll always be in control of our fates. Even a man in his seventies has the ability to “throw off the bowlines” and travel as Twain would say, but it’s better to reflect, to assess, and to wonder how exactly we want to live when we’re still free to explore and change our futures with relative ease. In the madness of our daily life, the ideas of our family, our friends, and our culture are slowly ingrained into our psyche, possibly distorting the person we think we want to be. The only way to get a clear view is to spend time somewhere far from these things. Sometimes it’s only once we’re separated from both home and the expectations of others that we’re able to be honest-with ourselves. Different countries and different cultures mean different dishes and different food. Yummy food! I personally think eating is one of the more fun things to do in life. So travel and eat incredible Indian, Thai, seafood, steak, rice, roasts and much much more. There are 195 official countries in the world. When travelling, you have hundreds of choices of where to go, how long to stay and what to do. You can go to a place for adventure, sports, culture, work or just total relaxation. You can even make it a combination of all of the above. Whoever you think you are right now and whatever you think you want from life right now will change if you travel for a long time. You will see the world, experience different cultures and meet many people. You will learn much about yourself and your expectations and goals in life may just change completely. Living in one place for a long time (or all your life) can lead you to believe that everyone else has the same customs and habits. Venturing out to other countries with different cultures to yours can be really eye-opening. The ways in which people live throughout the world are truly fascinating. Now it is your turn:​ ​Do you love to travel? Help support your small businesses by booking your travel needs with your local Travel Agents. There is a common misconception going around that travel agents have gone the way of the dinosaur and are not needed to book a cruise. After all, we have the internet and anyone can book that dream vacation themselves online. Here are 5 reasons why you should consider using a travel agent to book your next cruise. Customer Service – The most important reason for using a travel agent is the one on one personal customer service that you will not get when using a discount travel site or online booking engine. A good travel agent will be able to answer all of your questions and guide you through important steps such as choosing the right travel insurance that meets your specific needs. Knowledge– When using a travel agent, you get free access to years of knowledge and experience that can help you pick the right cruise and cabin. Travel agents also keep up on any rule changes that cruise lines make (smoking on balconies, gratuity costs, dinner and drink packages etc) so you won’t have any surprises when you embark on your cruise. Travel agents also are able to take ship inspections on cruise ships giving them valuable insight to a variety of ships. You can use the knowledge they have to make sure you book the right cruise. I know a couple who booked a cruise themselves and had a miserable time saying they will never take another cruise. If they had used a travel agent, they would have known that the cruise they chose had much more a party atmosphere than the quiet, relaxing trip they were expecting. Travel agents will steer you towards the cruise that fits your expectations. Price– A common myth is that using a travel agent will cost you more than booking it yourself. In reality, the opposite is actually true. Travel agents from large agencies will have hundreds of groups on various cruises. They can book you into these groups giving you the group rate that is not available to the general public. Added amenities are also commonly given to groups like onboard credit, free photos, bottle of wine, and complimentary dinners at specialty restaurants. Travel agents receive emails daily from the cruise lines informing them of special promotions that they are offering. By using an agent, you can take advantage of the best deal using these promotions that you may have otherwise never have known about. There is no surcharge when using an agent. The agent will receive a portion of the cruise fare as their commission, but that comes out of the cruise line’s pocket and not yours. Save Time– Using a travel agent can save you a lot of research and time that you may not have. Tell your agent exactly what you are looking for and let them get back to you with several different options. They will use your interests, hobbies, and expectations to find the best fit for you. A travel agent may also interest you in a cruise that you may not have even known about. Travel agents are not going the way of the payphone, beeper, and CRT TVs. They are as important as ever and come at no additional cost to you. Did you know that cruising supports small businesses? We owe the industry’s success to our 20,000+ travel agencies and 30,000+ travel agent professionals, many of whom are small business owners and operators. Be it: Cruise, Air, Hotel, Rentals (Condos , Beachfronts) or Rental cars.